I thank all of you for so graciously hosting me here today at the prestigious German Council on Foreign Relations. I have heard so much about your work as the premier network for foreign policy in Germany for well over 60 years. To be here at your institute on my first official visit to your great country as Foreign Minister of Sri Lanka, is indeed an honour, and I have been overwhelmed by the warmth with which I have been received by everyone since my arrival on Wednesday. My topic today is ‘Contours of a new Sri Lanka’. As you are aware, Sri Lanka is an ancient land with a recorded history dating back thousands of years. A land where a rich civilisation thrived, steeped in tradition and culture. An island located mid-way between east and west in the ancient sea routes known to many, and featured prominently in ancient maps. As early as the 8th century, Archbishop Harbanus Maurus of Mainz wrote about an island called Taprobane that abounded in precious stones and elephants. In the introduction to his book ‘Germans in Dutch Ceylon’, Major Raven-Hart wrote that all the really vital accounts of lives in Dutch Ceylon were written by Germans serving in the Dutch Forces. Freudenberg and Company initiated by Philipp Freudenberg was a major name on Sri Lanka’s economic horizon during the time of World War I. Freudenberg was appointed Consul in Ceylon. Professor Wilhelm Geiger whose son is famous for having invented the Geiger scale was well-known for his contribution to unravelling Sri Lanka’s past, and for the scientific study of the Sinhala language. His translation of Sri Lanka’s ancient chronicle, the Mahavamsa, is still regarded as the most authentic translation of that monumental work. Another prominent German linked to Sri Lanka is Marie Musaeus Higgins, a German Buddhist educationist who founded a leading education institute for girls in Sri Lanka well over a century ago. The school is named after her, and remains even today as one of the leading private education institutions for girls in the country. In this context then, why do I speak of a “new” Sri Lanka? I speak of a ‘new’ Sri Lanka in the context of the changes ushered in after the Presidential election in Sri Lanka on the 8th of January this year. As you all know, 19th May 2009 saw the end of three-decades of violence unleashed by terrorism in my country. In the immediate years that followed, we failed as a nation, to achieve meaningful reconciliation. The past 6 years or so since May 2009 saw Sri Lanka take an unfortunate journey on an autocratic path. In a manner very similar to the way in which the Enabling Act in Germany was passed through force, blackmail and other methods President Rajapaksa too tried to make himself President for life. Civil liberties were curtailed, independence of institutions including the judiciary was compromised, democracy was weakened, the rule of law was undermined, and good governance practices and human rights were violated with impunity. In the words of President Maithripala Sirisena who addressed the nation last Wednesday on the 6th anniversary of the end of the conflict – though the Government at the time achieved some success on infrastructural development since May 2009, the nation failed to mend the broken hearts and minds of our people who suffered from prolonged conflict. We failed to address the causes of conflict in a manner that would guarantee durable peace, meaningful reconciliation and non-recurrence. Divisions in society were becoming deeper along religious and ethnic lines, freedom of speech and expression were curtailed, and fear and intimidation pervaded society. Our nation which had been a prominent and respected member of the international community, including in the United Nations, for long years, abandoned her natural foreign policy of engagement, and chose instead, to follow a policy of antagonising traditional friends and partners, and isolated itself from the world community. It was in this backdrop of a sense of total despair, that several parties in Opposition, which I like to call the ‘Rainbow Coalition’ joined forces. We came together to field a common opposition candidate, Mr. Maithripala Sirisena, at the Presidential election in January 2015, in response to the call by a large section of people in Sri Lanka who were yearning for change. Despite an election campaign which was deeply flawed and one-sided, the rainbow coalition of the opposition scored a decisive victory on the 8th of January, on a platform promising far reaching democratic and constitutional reforms. Asia’s oldest democracy reasserted its commitment to democracy by dislodging an emerging dictatorship in typical South Asian style, laid back and non-violent. Instead of the stones, pellets and bullets of the Arab Spring, Sri Lanka’s ‘Rainbow Revolution’ succeeded through the power of the ballot. Over 81% of registered voters exercised their franchise on 8th January, (which I believe is the highest turnout since independence) silently, peacefully and decisively, resulting in a swift transfer of power the very next day. As keen followers of international affairs, you must all be familiar with the monumental changes that have been taking place in my country since the Presidential election that took place on the 8th of January this year. further, they sought through this election to set standards for their leaders to abide by. Calling for an end to impunity and corruption, people demanded that their elected leaders and public officials are made accountable for their actions and inactions. After a long time, since the 8th of January, Sri Lanka is once again the centre of the world’s attention for the right reasons. Of course, this change brings with it great responsibility that the new Government must live up to. President Maithripala Sirisena, Prime Minister Ranil Wickremesinghe and the Government are deeply conscious of this fact. For the first time in our nation’s history, the two main political parties, the United National Party (UNP) and the Sri Lanka Freedom Party (SLFP) have reached consensus to move forward in unison for a common cause – that is, to work towards achieving important national objectives, in keeping with the aspirations of the people of our nation. Following the election, President Sirisena was appointed as Chairperson of the party that was earlier headed by the former President, the Sri Lanka Freedom Party (SLFP). Although this phenomenon may have seemed strange to observers of Sri Lankan affairs, this act made it possible for the President and the Government to secure the support of the Sri Lanka Freedom party which has a majority in Parliament. Working together with so many different partners is a new experience for us which requires the Government to chart its path carefully and mindfully, through consensus building. This new approach helped the country achieve several important victories for the nation during the past 4 months as articulated in the Government’s 100 Day Reform Agenda which received the endorsement of the people at the January 8th election. Chief among these was the enactment of key legislation in Parliament and steps required to heal the wounds of our nation. In his addresses to the nation, the President has consistently articulated that achieving meaningful reconciliation is the only way forward for the sustainable progress of our nation. President Sirisena and the Government are committed to building a nation where diversity, openness, tolerance, and acceptance of others and their differences are cherished and celebrated; and, in the development of the nation, no individual and no community is left behind. The contours of a “new” Sri Lanka will be based on the vision of a nation that is reconciled, democratic, and prosperous, with a united and entrepreneurial people, at peace with themselves, and at peace with the world. A nation that works in engagement and in cooperation with the international community and international organisations to address issues of concern, not only for Sri Lanka, but for the region and the global community as a whole. On the 6th anniversary of the conclusion of the conflict earlier this week, the President emphasised that “development and reconciliation” are the Government’s main objectives and that this should be the priority and underlying theme that must inspire the people of Sri Lanka including the security forces in carrying out their duties and responsibilities towards the nation in their day to day efforts in future. He emphasised that the reconciliation process would primarily need to include truth seeking, justice, eliminating fear and suspicion, building trust among the communities as well as rebuilding destroyed physical infrastructure. In the future, this day will be used to reflect on the causes of suffering and will commorate the suffering of all. The emphasis on the twin objectives of ‘reconciliation and development’ on the 6th anniversary of the conclusion of the conflict, closely follows the adoption of the ‘Declaration of Peace’ by the Government earlier this year on the Independence Day (4th of February), where the nation paid respects to all who lost their lives to violence, and pledged to never allow our land to be traumatized again by the shedding of blood of her citizens. In a clear departure from the triumphalist approach adopted in the past, the people of Sri Lanka, this year, finally had their freedom to grieve restored. They were free to reflect and remember those whose lives were lost or marred by violence. The fact that there are no victors in conflict is something that is well understood by the Government and the people. The toll that violence unleashes is not a price future generations of our nation deserve. Every possible step therefore, will be taken by this Government, to ensure non-recurrence. We also want to learn from Germany’s example and look to suffering of the past years as an exhortation to humility and moral honesty. While meaningful reconciliation would take time, as it involves a process of healing, it is nevertheless an essential factor for the country’s progress. Recognising this, the Government, within days of assuming office, appointed two very senior former civil servants as Governors in the former conflict affected Provinces of the North and the East with a view to initiating measures to strengthen civilian administration. These posts were previously held by military personnel. Along with this step commenced a series of additional measures to address the particular requirements and grievances of the people in these areas. This includes seeking tangible solutions to the complicated issue of land ownership. The High Security Zone in the Northern Province is being progressively reviewed and land is being returned to the people. 430 acres of land was released on 23rd March and 570 acres on 10th April. While a gazette notification was issued releasing 818 acres in the Eastern Province, a restraining order was issued by the Supreme Court on the release of this land. I am told that this has now been lifted which will allow the release of this land to proceed without further delay. Resettlement related issues of the internally displaced are being addressed in consultation with the relevant entities including UNHCR. The Government is working with the UN Country Team and the UN Secretary-General to obtain assistance including technical expertise through the UN Peacebuilding Fund for reconciliation projects including capacity building for the Northern Provincial Council and resettlement. All Sri Lankan refugees living overseas have been invited to return on a voluntary basis. Some have already begun returning from South India. Right to Information was made a fundamental right through the 19th amendment to the Constitution that was enacted on 28 April. Demonstrating its commitment to engage actively with civil society and the human rights community including human rights activists, the NGO Secretariat was shifted away from the purview of the Ministry of Defence and placed under the Ministry of Policy planning and Economic Affairs. The most important piece of legislation enacted by the Government during the last 4 months, in keeping with its promise to the people, is the 19th Amendment to the Constitution. This repealed the controversial 18th amendment to the Constitution which sought to concentrate power in the Executive Presidency. The provision to make independent appointments to important Commissions was restored by this amendment. A Constitutional Council will be established very soon, as per this amendment, to provide for the establishment of independent Judicial Service, National Police, Public Service, Elections, Bribery and Corruption, and National Human Rights Commissions. Term limits on the Executive Presidency that were lifted by the 18th amendment were once again restored. A President can now hold office only for a maximum of two terms. The duration of one term which was previously 6 years was reduced to 5 through the personal intervention of President Sirisena. The adoption of the 19th amendment by near unanimity, with only one Member of Parliament voting against, was a remarkable victory for the people of our country. The passage of this amendment was a remarkable victory for democracy and it is our hope that this significant step which saw the opposition and government MPs work together would be a model and turning point in our political history. It is our firm belief that the two main parties will continue to work together in Parliament even after the General elections, to formulate important national policies that are required for the country’s long-term progress. The long delayed Assistance and Protection to Victims and Witnesses Act was enacted in February with all Members of Parliament voting in favour. While some detainees have already been released, a process of review of all cases of persons held in detention has begun. This process is being carried out under the purview of the Solicitor General with the ICRC working closely and holding weekly meetings with the officers concerned. We recognise the important role that Sri Lankan communities overseas, irrespective of their ethnicity, can play in contributing to the reconciliation process in the country and for the nation’s development as a whole in various sectors. We invite them and urge all of them to play a constructive and meaningful role in our nation’s progress. The Government is also investigating into large-scale fraud, corruption and malpractices that had taken place in the past decade. Legal action and constitutional measures are being taken to address these issues. Steps are being taken to bring about attitudinal changes so that people comprehend and realise the need for good governance for the greater benefit of all. The Government is taking action to ensure that expenditure for development, whether with local or foreign funds, are clearly used for the intended purposes alone, with necessary transparency. We are also determined to ensure that due processes are followed at all times. In the contours of a ‘new’ Sri Lanka, foreign policy will have a prominent role. After all, for much of our thousands of years of recorded history, Sri Lanka has been a country that interacted actively with the world outside. As an island nation, the people of our country have always welcomed visitors. There are many records of visitors being overwhelmed by the warmth with which people in Sri Lanka have welcomed them. In the framing and pursuit of foreign policy, we will be guided by what best serves the interests of all our people and not by any ideological fantasies. We are determined to restore our nation’s image as a responsible member of the international community. For much of Sri Lanka’s history since Independence, Sri Lanka was considered to be an important member of the international community including in the United Nations. Having joined the UN 60 years ago in 1955, Sri Lanka has contributed in many ways to the UN system including its norm setting processes. Many distinguished Sri Lankans have held important positions in the UN and its agencies. They have chaired important conferences including on the Law of the Sea and presided over the General Assembly as well as the Security Council. As a trade dependendent small island nation, the rules based international order has served us well and we are committed to its preservation and development. The last few years saw Sri Lanka drift from this traditional position of engagement not only with the UN but with the entire international community. Sri Lanka strayed from her traditional position of engagement and consensus-builder to confrontation, non-engagement and intransigence. This was an aberration. We recognize the importance of the UN and multilateral agencies as vehicles for international discourse and norm setting for the common good. Since assuming office, President Sirisena undertook his first State visit to India, our closest neighbour with whom the people of our country share civilizational ties. He also visited China and Pakistan and participated in the Commonwealth Day celebrations in London as Chair-in-Office of the Commonwealth. Having had the honour of receiving His Holiness Pope Francis within days after being elected, President Sirisena’s Government has been privileged in receiving several foreign dignitaries during the last 4 months. Prime Minister Modi visited Sri Lanka in March marking the first substantive bilateral visit by an Indian Prime Minister in 28 years. The Prime Minister of Bhutan, the Emir of Qatar, several Foreign Ministers including the US Secretary of State (the first in 43 years), deputy Ministers in charge of Foreign Affairs, and several senior UN officials honoured us by their visits. All this was achieved within just over 100 days in office. We are extremely appreciative of the support that the Government has been receiving from the international community. We are continuing our dialogue with the High Commissioner for Human Rights. We appreciate the understanding shown by the international community in February, by allowing the Government time until the September session of the Human Rights Council, to carry out consultative processes and take steps to address the setting up of necessary independent, credible, domestic processes to deal with issues pertaining to Missing Persons, and Accountability. The UN Special Rapporteur on the promotion of truth, justice, reparations and guarantees of non-recurrence visited Sri Lanka in late March – early April. We will be receiving the Working Group on Enforced and Involuntary Disappearances in early August. It is our hope that the High Commissioner for Human Rights will also visit before September. At the highest levels of Government, deliberations are taking place on the best means to deal with Missing Persons issues and Accountability issues. The Government recognizes the importance of these processes to achieve meaningful reconciliation. As you would all agree, to be effective and successful, such processes need careful thought and deliberation. They must also receive the widest possible support and acceptance to succeed and be aimed at guaranteeing non-recurrence. The relevant high authorities in Government are seized of these concerns and remain engaged in deliberating on these issues with due seriousness. The Government’s intention is to work with ICRC in establishing a mechanism that addresses the concerns pertaining to Missing Persons. The South African Government very generously shared with us, their experience in truth and reconciliation in February. We will continue to work with South Africa as well as other partners, in formulating mechanisms to deal with issues of reconciliation and accountability that would suit our requirements. Sri Lankan soldiers recently participated actively in earthquake relief efforts in Nepal. They are expected to continue to assist in projects that the Government of Sri Lanka intends to undertake in rebuilding Nepal in the future. As they disengage from commercial and civilian activity, it is our hope to have them contribute increasingly to such humanitarian efforts including UN peacekeeping. Although the Government has achieved much during the last 4 months, ensuring that the contours that I set out are translated into lasting reality is a challenging task. Another pillar of the new government’s foreign policy is engaging with the diaspora. Per capita Sri Lanka probably has one of the largest diasporas in the world and it is also one of the most illustrious diaspora communities. But to our loss they have not featured prominently in our foreign policy making, and as a country we have done little to harness their capital, relationships and knowledge for our development. As a first step we hope to have a Diaspora festival in Colombo towards the end of the year. This celebration of the diaspora will bring talented members of the diaspora from all walks of life – artists, scholars, businesspeople are just a few examples – and residing across the world to assist in Sri Lanka’s reconciliation and development efforts. A lower middle income country, Sri Lanka is striving to reach upper middle income status. Our key challenges include increasing investment including in human capital, realigning public spending, enhancing the role of the private sector, increasing exports and productivity and ensuring inclusive growth while achieving sustainable development. Economic growth in our country has been among the fastest in South Asia. Yet, due to the policies that were adopted in the last 8 years or so, proper procedures were not followed and some statistics are somewhat suspect. Human Development Indicators in the country are impressive by regional and lower-middle-income standards. Sri Lanka has surpassed most of the Millennium Development Goal targets set for 2015. Yet, considerable challenges remain in terms of dealing with an ageing population, poverty in certain districts including in the conflict affected areas, addressing unemployment issues, effecting structural reforms including public sector reform, increasing public-private partnership and increasing competitiveness. So as you see, the contours of the “new” Sri Lanka are not without challenges. Yet, the Government is willing to deal with these issues and remains committed to the important and historic journey that it undertook on the 8th of January to ensure the realization of the aspirations of all the people of our country. This is not a task that we can achieve on our own. We need the support of the international community especially to ensure that the gains that we have made in the last four months are not lost but built upon and strengthened further. We need the world’s democracies to stand with us and support us to ensure that the people of our country do not become discouraged and fall prey to autocratic or racist forces while we travel on this journey. We need to demonstrate to our people that reconciliation, peace, rule of law and good governance are essential features for sustainable development, progress and prosperity. Support for Sri Lanka in this endeavour also means understanding that certain processes take time and must be approached with due appreciation of the sensitivities involved, which, if disregarded, could endanger the journey that we have embarked upon. The German Government and the people of this country have been supporting Sri Lanka for long years ranging from the construction of dams to development assistance and vocational training. A large number of initiatives funded by private individuals from Germany are also helping Sri Lanka in numerous ways. We are delighted with the initiative by Germany to establish a vocational training institute in Kilinochchi that will be functional next year. German expertise in this sector is unparalleled in the world and we are deeply appreciative for the decades of service rendered by the German Technical Training Institute in Moratuwa which trains hundreds of automobile and other technical trades every year. Further to my discussions today, I am pleased to say that we are exploring a new chapter in relations between Lanka and Germany that will help cement our strong ties. Through the twinning of Lankan and German cities we hope to establish people-to-people contact that will help expand our already multi-faceted relationship. In particular we look forward to the exchange of knowledge, best practises and experiences in all the areas of our public life – including governance, economic development, technology and education. The new Sri Lanka’s economic policies have also been calibrated to serve the interests of our people. Post-war growth was unsustainably propelled by consumption and construction. Our policy is to create sustainable growth by unlocking Sri Lanka’s long untapped economic potential through foreign direct investment, trade and tourism. Sri Lanka has long been a paradise for German tourists, and we are now making it a paradise for German investors. With relatively well developed infrastructure and human capital our immediate priority is to reset the investment climate by making Sri Lanka the most secure, efficient and competitive investment destination in South Asia. As noted above, we have re-established the independence of the judiciary and we are in the process of creating a rule based system where all companies will enjoy a level playing field. Merit and merit alone will be the sole criterion of success in the new Sri Lanka. Second, we are making our economy more efficient through smarter regulations – we collaborating with industry, academia and our international partners to make rapid progress on the World Bank’s ease of doing business index. Efficiency will also be improved through the reviving of a “one stop investment shop”. Third, Sri Lanka is a gateway to India, Pakistan and the broader Indian Ocean region. We have successfully signed free trade agreement with India and Pakistan, and we are currently trying to upgrade the FTA with India to a Comprehensive Economic Partnership Agreement. We are also currently in the third round of negotiations to sign a free trade agreement with China and discussions with the United States for further trade access are also underway. Over 100,000 German tourists visit us each year. As we embrace the world again we hope this number will increase. But we are also putting things right at home. Sri Lanka climbed 11 places on the Tourism Competitiveness Index this year and we hope to build on that success in the coming years and resorts in the previously war-ridden Eastern Province – where many of Sri Lanka’s finest beaches are found – opened recently. The German model of social market economy is something Sri Lanka can learn from. The space and opportunities for us to work together and cooperate have now expanded. In the ambitious yet essential journey that we have undertaken to ensure durable peace and prosperity for our people, we require your assistance more than ever before. We trust that the Government and the people of this country who have been working with Sri Lanka for very long years will continue to stand by us and intensify support for us in this important journey. 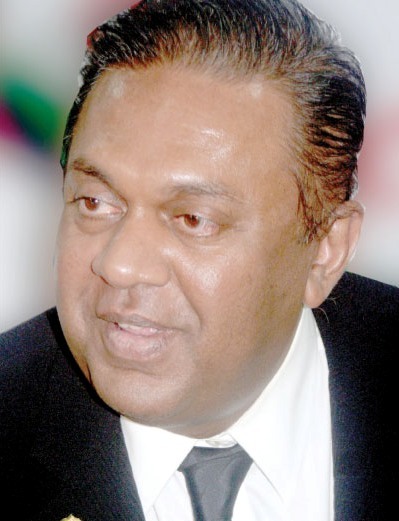 Minister Mangala Samaraweera has blossomed into a senior politician of the class of a Statesman. What a tragic and petty mistake the Rajapakse Brothers made in removing him as Foreign Minister at the start – in bad taste and for no valid reason. The Foreign Ministry became a joke since then. Chaos and comedy prevailed there since then. I am afraid it is far too early for a Diaspora Festival in Colombo – if this is scheduled for late this year. The Sinhala extremists have poisoned the mind of the average Sinhalese voter who believes the Tamil Diaspora is nothing but the LTTE in disguise. This is sheer nonsense – but then that is what Sri Lankan political play has been for a long time. A Good Speech. However, a few minor edits. As you are aware, Sri Lanka is an ancient land belonging to the Native Veddah Aethho(People) with a recorded history by the Paradeshis(Paras) dating back 2 1/2 thousand years. A land where a rich Para civilisation thrived, steeped in tradition and culture. An island located mid-way between east and west in the ancient sea routes known to many, and featured prominently in ancient maps. The conflict in the Land was between the two primary Para groups. Para-Sinhala and Paa-Tamil. The Para-Politicians have exploited one on the other, resulting is sustained conflicts during the past 60 years. We need the help and guidance of the German people and the rest of the world to fix this Para Problem, because we cannot fix it ourselves. Like your Auf Wiedersehen, yes Goodbye, Mr. FM Mangala. In usage, it means goodbye for the English speaking World, but in German it means “until we see again:. So. 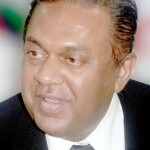 Mr. Mangala Samaraweera will be around for sometime. Auf Wiedersehen is fairly formal in German; it is unlikely to be used between close friends and family members. It is usually used only with people one would address as Sie, not with those one would address as du. Mangala may have good intentions but as the news from the north and east tell their own tale. There are videos on YouTube of police walking Into homes, dragging out its occupants and them in the street just yesterday – accountability anyone ? Mahendran scooped up 7500 Million out of the extra 13 Billion at the higher rate which was 3 percentage points above the market rate. All this time I thought it was only LKR 5000 Million . And calculated the remittances to the Perpetual Family trust at that low amount… My apologies. Extra LKR 2500 Million is no small change.. Right. Uncle personally ran the ruler over the bids according to the new revelations by the Opposition Leader and the legit PM if some of the SLFP MPs had real Balls. And one Mr Samararwickrea and a few big Wigs of the UNP were there too at the Bid Opening Ceremony. Wonder who this Samarea is? I am glad this Samare hasn’t forgotten our Mahawamsa. In fact he reminded the Germans of our long history in his preamble. The sad fact is Samare himself is part , I mean a big part of the demolition crew. As Dr Dayan says Mannar to Mullative across Vauniya will have a border protection soon, if Samre and his mate Ranil score at the next Election. Now that JJ is back on Deck the partition will ensure she keeps the CM job until she carks it. Batti to Wipattu will also be out of bounds to the great majority if Uncle Kerry likes our Wahabis. Bodhi Sira will be in the pastures after 6 years, if Ranil allows him the full Term.. This man Sumanasekara will die one of these days bursting a blood vessel for the hatred he has towards Ranil. So when Ranil romps home with a comfortable majority in Parliament at the next GE, that is it for Sumanaya. Foreign minister Mangala managed magnificently mixing the country’s soft power including ideological, cultural and social values and applied cultural and political communication strategies both at a theoretical as well as practical level in order to achieved our foreign policy goals bilateral as well multilateral relations with Germany. in building Srilankan national image not only India China but USA UK but with West Europe, deviating from hypocritical anti-imperialism mindset of the deplorable foreign policy of the pathetic aberration of professorial past. John Kerry was absolutely precise when he said If Lakshman Kadirgamar was here and he had lived to see this new era united and entrepreneurial people dedicated to making their country a shining jewel of the Indian Ocean and of the broader Indo-Pacific. The guy goes on and on about the diaspora as if they are to be the saviours of Sri Lanka. Nothing about the struggling masses anyhow, and their need for preservation(other than the mention of the historical past). Doubt the average Lankan is going to be too happy about the country being sold to foreign investors via the Diaspora! He is still awaiting the “New Contours of Sri Lanka” from the diaspora that he used to hang out with. JR’s presidency did breed a large group of Sinhala traitors. This speech has over 4,600 words and 100 paragraphs. Who has the time and energy these days to read or listen to such a lengthy discourse unless it is made by Hitler, Lenin, George Washington, Churchill or Castro? This man is an unelected Minister reading what a speech-writer has written for him. At least have a summary or a concluding paragraph for our benefit..